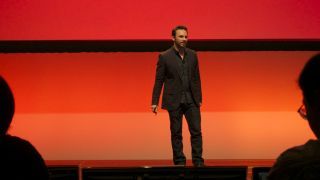 Oculus CEO Brendan Iribe believes it's finally time for virtual reality. And while its first Oculus Rift VR headset has yet to reach commercial availability, Iribe is already teasing future features. Case in point? Support for supremely high-res screens. "Somewhere in the far future, you'll get resolutions in the 8K, 12K, where it will start to kind of plateau out in terms of what you see," he said during an AMD APU13 keynote, adding "that you can imagine the kind of GPU you'll need as this continues to improve and increase." As mobile screens, which Oculus Rift uses for its headsets, get to higher resolutions and better quality, Rift will follow. "The resolution will only continue to go up," Iribe went on. "Cell phone resolution will only continue to go up. We're going to continue to push for higher resolution in the headset. It really makes a difference." Iribe segued into Oculus' push towards faster motion to photon speeds and the levels the headset needs to reach in order to lock in at 60fps. "The developer kit we are shipping today is around 40-50ms from motion to photon," he explained. Because it doesn't lock at 60fps, stutters occur, like frame dropping as you move your head. CTO John Carmack describes the sensation as like "getting hit in the temple," Iribe relayed. Add to this "incredible motion blur," and it's an experience Iribe said is "just not good enough for mass market, not good enough for consumers. " There is a solution, albeit only inside Oculus' walls. "What we're looking at internally for the future is to actually deliver a much faster experience. What we're looking at is delivering something on the order of 15ms, less than 20." "Seven to 15 is sort of the Holy Grail, [but] this is awfully hard to do. We now have internal prototypes inside of Oculus, [and] Valve also has internal prototypes they've been working with us on R&Ding where we are able to reach this kind of performance. And the experience is magical. It literally changes everything." "You go into VR in the future, there will be no pixel smearing, there will be no motion blur," Iribe continued. "It will be very comfortable. This latency will be a checked off solution. We're not there yet today, but it's coming very quickly." It's unrealistic to get the game engine to run at a necessary 500-1,000fps, he added, but said there are ways to push the rendering thread to 80fps or 90fps and have game time run slower, thus achieving (even through tricks of the eye) a faster, smoother gaming experience. Unfortunately, it's not as simple as fiddling with render times as the CPU, for one, gets eaten up decoding more camera sensor data. Iribe sounded optimistic, as one would expect the CEO of a VR company to be, that Oculus can overcome these technical obstacles. "This is just the beginning," he said. "Today we're really just focusing on vision. Today we are already starting hit the limits of the CPU and GPU." The "Oculus face" - the agape expression wearers tend to exhibit when using Rift - is well documented, but Iribe acknowledged that after the initial amazement, users inevitably wonder where their hands are. "Imagine more cameras, and we try to get your hands in the game," he said. "You want to see your hands. You're going to want eye tracking. You're going to want mouth tracking. You really do want to be fully immersed in the game. It's not going to happen for v1 - we're probably not going to see hands for v1 - but it is going to come." He went on to say that immersion will go beyond wearers' person. "You will engage with players. You'll engage with both multiplayers [and] you'll engaged with bots. From the first time you make eye contact and when you're moving around, they're going to follow your eyes. You're going to emotionally feel like you're really there and emotion is going to be a part of VR." Like Google Glass, Oculus Rift isn't forgetting about four-eyed users. "We are working on supporting glasses and supporting people who have near-sightedness and far-sightedness," Iribe said. "It is on the top of the priority list. We'll have to let you know more in the future, but it will definitely be there." AMD has a kickin' new APU, one you'll learn more about at CES 2014.